Each year in spring, our tea master sources high quality leaves from excellent Uji producers in the Kyoto prefecture to assemble a comprehensive range of flavorful teas revealing the culture of balance, elegance and appreciation of a rich Umami typical of high quality Uji teas. The Gyokuro, Kabusecha and Sencha included in our range of Uji teas is listed below. 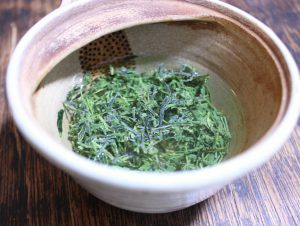 This first harvest tea is a blend made mainly from tender spring leaves produced in the Shirakawa district within the limits of Uji city, coupled with some leaves grown in Uji Tawara. 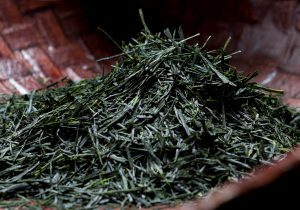 The Shirakawa district has been well known historically for its production of high quality Tencha and Gyokuro, while Uji Tawara is renowned for its quality mechanically harvested Gyokuro. The Shirakawa district benefits from a terrain possessing just the right inclination, along with a clay soil which retains nutrients well. 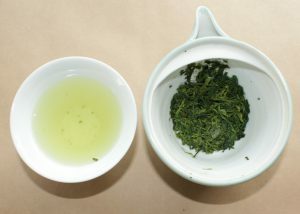 The result of this topography are Gyokuro possessing a rich flavor and a splendid fragrance. 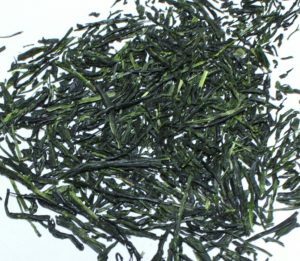 The blend of Shirakawa and Uji Tawara leaves allows for the crafting of a delicately balanced, umami rich and fragrant Uji Gyokuro. 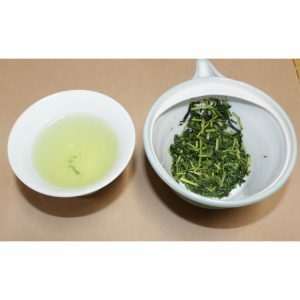 This tea is assembled from tender leaves grown in the south of the Kyoto prefecture. The blend is composed of Kyoto cultivars including Samidori, Gokou, Uji Hikari, Komakage or Houshun, depending on the lots selected by our tea master at the spring Uji tea auction each year. 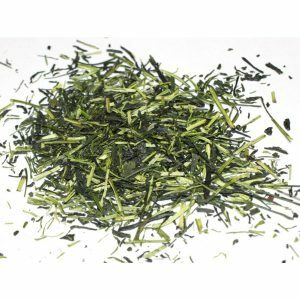 This tea reveals the typical ‘ooika’ fragrance ( 覆い香- literally ‘cover fragrance’) of high quality shaded teas from Uji and offers an excellent tasting experience on an affordable budget. The shading the tea fields from direct sunlight for a set number of days before harvest to obtain umami rich teas (Matcha, Gyokuro, Kabusecha) is a production method originating from the Kyoto prefecture. As such, the Kyoto prefecture producers excel at producing high quality shaded leaves which, sourced and blended by our tea master, result in this excellent Kabusecha representing the culture of elegance, balance and rich umami typical of high quality shaded teas from Uji. The leaves included in this blend have been shaded between 14 to 20 days before harvest according to kyoto Kabusecha production standards. This blend reveals a rich umami that might make the drinker think of a Gyokuro flavor, along with Sencha like sharper notes. This tea will reveal an addicting flavor when infused thoroughly at low temperature and will allow drinkers to indulge in delicious daily tea times. This approachable tea can be enjoyed at any time, by anyone (confirmed tea drinkers and beginners alike). 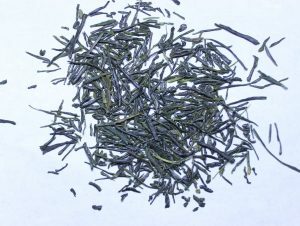 The blend is composed of mellow Kabusecha leaves and strongly dried, sweetly fragrant stems. It is assembled by our tea master so that it can yield a smooth Gyokuro like flavor with reduced astringency even if infused at high temperature, which makes it easy to use and infuse on a daily basis. Infused at cold temperature, the flavor will also be interesting with comforting, full bodied, deep savory notes. The rich flavor of this blend will shine at both low and hot temperatures. 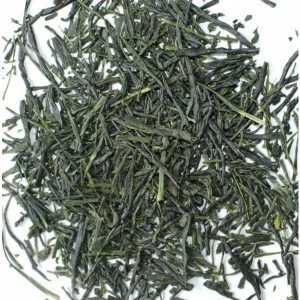 This quality tea including Kabusecha stems and leaves has mild flavors and and its stems reveal a sweet aroma. Easy to infuse, it is a perfect choice when tea needs to be prepared for house guests or visitors in office settings. Special blend 2018 limited edition blended by our tea master, Naoki Kagata. 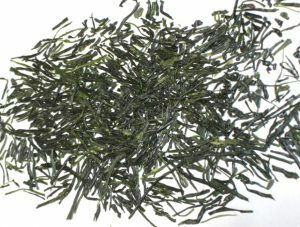 The 2017 version of this tea won the ‘Fine Product Award’ equivalent to a silver medal at the 2017 Nihoncha Award. As we have been saying quite often, traditional Sencha produced without shading periods of the field before harvest are becoming more and more rare in Japan, and we wish to participate in the preservation of this production method. This is why our tea master chose to use ‘pure’ Sencha leaves grown in full sunlight for this blend, in order to promote the appreciation of traditional Uji Sencha and to prevent this production method from disappearing. 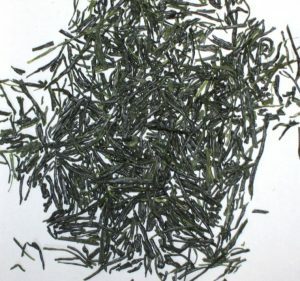 This unique blend takes its name from its production method as ‘Hinoka’ could be translated into ‘Sun Fragrance’ in English. The freshly assembled Uji Sencha Hinoka blend is composed of only two varieties of 2018 spring Sencha grown in Wazuka in the Kyoto prefecture. 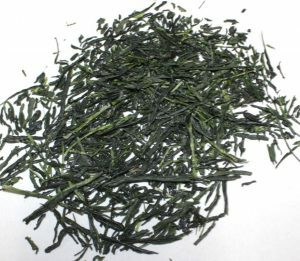 The main base for this tea are leaves of the Okuyutaka cultivar grown by Mr. Minato, who also grows our single field Kabuse Sencha Saemidori. The Okuyutaka leaves lend their fresh, almost spicy fragrance reminiscent of cinnamon and gentle umami to the blend. The second cultivar, Yabukita, offers balance and pushes the umami revealed by the liquor to a deeper, denser level. By combining these Sencha varietals in an effective ratio, our tea master, Naoki Kagata, was able to craft a blended tea like no other. 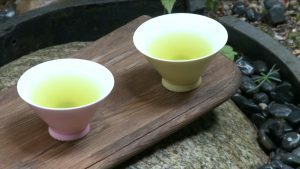 It is not common to find Japanese blended teas revealing one of a kind characteristics, as they tend to follow trends and resemble one another. 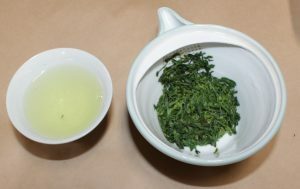 However, in spite of being composed of two types of leaves grown by different producers, the Uji Sencha Hinoka reveals a unique personality, not unlike the single field, non blended Uji teas that Rishouen strives to promote. This incredibly high quality Sencha bewitches everyone who savors it. Assembled by our tea masters from dazzling, tender, extremely young spring leaves sourced directly from excellent Uji producers (some direct trade & some leaves offered during the early days of the Uji tea auction), this unique blend represents the quintessence of Japanese Sencha: elegant aroma, purity and complexity of flavors, sweet notes and deep umami, soft and delicate liquor revealing just the right amount of gentle astringency. Beautiful dark green leaves left to grow in field a little longer before harvest than the leaves of our higher ranked Mujou Betsugi Sencha mentioned above. 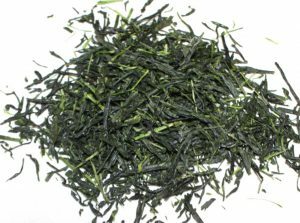 This blend composed of leaves that are still tender but more mature brings forth a strong flavor with the combination of delicacy and depth expected of a high quality Uji Sencha. 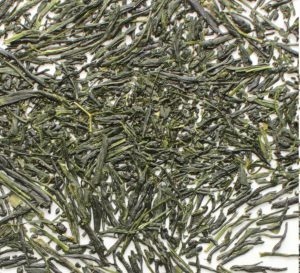 The leaves of this Sencha have been cultivated until full growth, and thus this tea is characterized by a strong and complex taste. Its delicate astringency will attract the palates of demanding gourmets and the curious beginners alike. 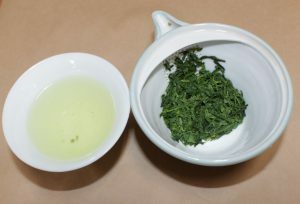 This Sencha is one of the staples at Rishouen and one of our best sellers. We drink this tea everyday during our morning breaks at the office accompanied by salty or sweet snacks to invigorate our body and stir our spirit. 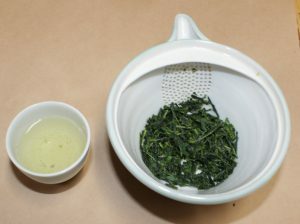 This tea also gives the first impression of Rishouen teas, as this Sencha is served routinely to each person who comes see us in our office in Uji. 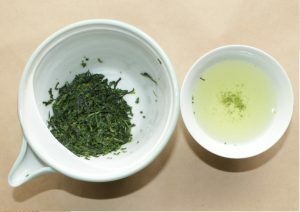 Our Betsujou reveals the fresh fragrance expected of a good Uji Sencha. 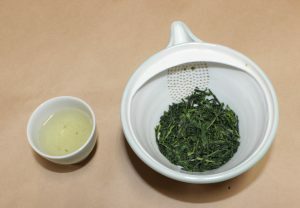 The full bodied, supple liquor offers the balance between the rich, deep savory flavor and just the right level of pleasant bitterness typical of excellent Sencha from Uji. We recommend trying an infusion at lower temperature (60C) to enjoy its rich umami, with subsequent infusions at higher temperatures to enjoy a large palette of savors, ranging from mellow and round to swift and refreshingly bitter green. Refreshing and elegant. 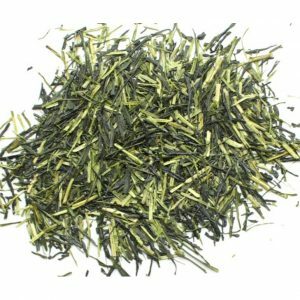 This Uji Sencha is assembled by our tea master to offer an excellent tea value to quality ratio for tea lovers wishing to obtain a balanced yet affordable tea. Delicious Sencha astringency. 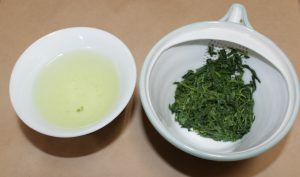 A great introduction to Uji teas for small budgets. Traditionally, the “Jou” rank serves as a reference point for experts to easily judge the overall quality of the tea house. 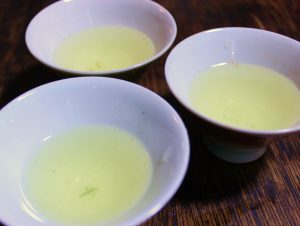 This rank is considered to be the base, which gives an idea of what can be expected of teas ranked above in the range offered by the tea merchant ( Tokujou, Betsujou, Gokujou…). When the occasion arises to visit a tea house and taste several teas, we suggest trying teas of this rank first.